FAB1 is a Gerry Anderson TV Series fan site. Are you trying to find out what F.A.B. stands for? * To access the sound clips click on the speaker console. Download the "Thunderbirds March" here. Right Click your mouse over the International Rescue logo and select "Save As" and save it to a location on you PC. It's been quiet on the Thunderbirds front lately so I've taken up mountain biking to occupy my spare time and keep me fit. In June this year we're off to Scotland to compete in the "10 Under the Ben" 10 hour endurance mountain bike race at Fort William. To find out more jump to the mountain bike page here. stories and tricks of the trade. recipient. It will also include a 10x8inch rare photograph. Thunderbirds is being shown once again on New Zealand TV screens. Prime TV is running the series on Saturday afternoons at 2:30pm. What a great way to enjoy the afternoon! Well things have quietened down since the Thunderbirds Movie hit our shores. The movie is out on DVD and has been selling well... however the best deals for Supermarionation fans are the Joe 90 or Captain Scarlet DVD Box sets which can be purchased for NZ$50 if you can find them. Enjoy the site and drop me a line if you have any questions. International Rescue and the fantastic Thunderbird craft have come to the aid of the New Zealand Meningitis Trust. Thunderbird mania has swept the country as Meningitis Trust Thunderbirds badges launched out of The Warehouse stores throughout the country as fans flocked to collect the 5 rescue vehicles. PS They make a great Christmas gift for those Thunderbirds fans. September 9 2004 is the New Zealand launch date for the new Thunderbirds Movie. There will be no official premiere but I'm sure there will be plenty of Dad's lining up with th kids on opening night! 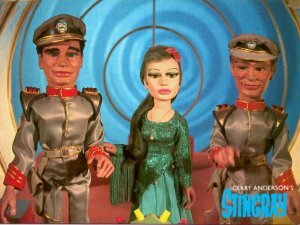 Also check out some of the FAB items for sale at Janco Toys - Jan and Colin specialise in Gerry Anderson Memorabilia and are taking orders for replica puppets made from the original moulds. They also have a great range of limited edition, high quality Thunderbird's replicas. I found a boxed set of the Captain Scarlet DVD's - what a bargain for $50! The Parker puppet below failed to reach reserve. A replica Parker puppet is up for auction on ebay. Parker was hand crafted and made from the original moulds used to create the cult 1960s series. 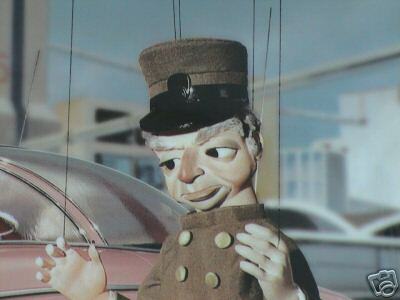 He was made for poster advert in 2000 and is an exact replica of the original Parker puppet. As the ad was not for TV, he does not have internal head mechanics to move eyes and mouth. He is strung for puppeteering and comes with a display stand. Click on the picture to see the auction... and happy bidding. 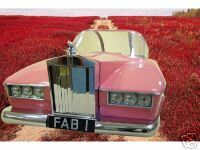 FAB1 has sold for 80,000 pounds! The genuine Rolls Royce FAB1 that was built for the movie Thunderbirds Are Go! is currently up for sale on ebay. If you think you'd like the 8.5 foot can in your garage ... think again - the current price is over US110,000! To check the auction follow the link below. That might not sound like something new but MGM Home Entertainment are releasing a special Thunderbirds International Rescue Edition featuring "Thunderbirds are Go!" and "Thunderbird 6" . The giftset takes off on July 20th just in time for Universal’s theatrical remake of Thunderbirds on July 27th 2004 (United States release). For more on the re-release follow Thunderbird 1 below. The other exciting news it the re-release of Joe 90 and Captain Scarlet on DVD. If you can find them they are selling as boxed sets for only NZ$50. I've been lucky enough to get my hands on the Joe 90 set but Captain Scarlet has so far eluded me. If you find them grab them quick! For the first time in 3 years www.fab1.co.nz went offline due to a computer glitch with our ISP. Fortunately I have been able to restore the site and its business as usual. Sorry about the inconvience for those that couldn't find the site whilst it was out. Maybe the solar flares we have been experiencing recently have affected transmission from Thunderbird 5! Brains' technology for your credit card! Also appearing on this site for the first time are details on the Zed Smart Credit Card featuring Brains. Included on the Zed page are two of the advertisements as seen on New Zealand TV. To check it out follow the link below. I've been a bit quiet on the FAB1 site this year with work and family keeping me busy. I have finally made contact with the people who have made the "Zed" credit cards ads featuring Brains and I'm hoping to be able to feature some exclusive facts and details regarding the ads. Due to several requests I have placed a link on this page to enable visitors to download the "Thunderbird's March" midi file to their own PC. See the link above the News section. I would like to wish all visitors and Gerry Anderson fans a Merry Christmas and a happy and safe New Year. Since October 2000 there have been over 18000 individuals viewing this site with many kind remarks and friendly emails received from them and I would just like to say thank you for all of them. Brains has been hitting the headlines in New Zealand with appearances on prime time TV promoting "Zed", a new smart credit card. A preview to the promotion was featured on TV3's main news and the advertisements have been screening regularly on TV along with full page newspaper spreads. I am currently trying to find out details about the puppet used for the filming, if anyone knows of any details then please drop me a line. Mark down the 26th of February 2002, as on that date an original Rolls Royce FAB1 from Thunderbirds is up for auction at Fleetwood-Owen auction house. An original Virgil Tracy puppet is also under the hammer. I don't know any more details at this stage but arrange that second mortgage quickly because things don't sell cheaply. Earlier this year Gerry Anderson's own Parker puppet sold for 39000 British pounds, his Lady Penelope replica for 15000 pounds and an original Alan Tracy puppet sold for 19000 pounds. Apparently the Parker puppet was purchased by a Japanese businessman. The Thunderbirds merchandise is still a popular choice for those Christmas stockings, I hoping to add to my collection in the next few days. Also coming are a few additions to FAB1. Shane Pickering has just forwarded me a copy of his excellent Thunderbird 1 cut-away artwork plus a sneak preview of his Thunderbird 2 cut-away. I'm also hoping to add a downloads page with Thunderbirds images and sounds, a full list of current Thunderbirds merchandise and a fan page featuring an impressive FAB1 replica trolley car. CAPTAIN SCARLET released on DVD. Blackstar are taking pre-orders for the imminent release of the full series of CAPTAIN SCARLET and the MYSTERONS. Titles will be available as a 6 disc DVD boxed set or separately on DVD and VHS. Also available on DVD and VHS from Blackstar are the movies THUNDERBIRDS ARE GO! and THUNDERBIRD 6, as well as all episodes of the TV series of THUNDERBIRDS. Coming soon will be a complete list and price guide of the latest merchandise available. Yes Thunderbirds are to be screened in New Zealand on TV3 commencing Saturday 30th June @ 2:55pm. It is the digitally remastered series that will offer new and old fans the best in picture and sound quality. Also new to New Zealand is the latest range of merchandise with books, videos, DVD's and a new series of toys. The only casualty of this is Joe 90. His series was screening on Prime TV but this now appears to have been shelved for the time being. Hopefully he'll be back soon. A deserving Gerry Anderson was awarded the MBE (Member of the British Empire) in the Queen's Birthday Honours list. 'THUNDERBIRDS' and Gerry Anderson feature in the latest edition of the New Zealand Netguide. Great to see and the editor assures me that FAB1 will be featured in an upcoming issue. Also look out for the next issue which will be featuring 'JOE 90' sites and links. I haven't any further details regarding the screening dates for 'THUNDERBIRDS' on TV3 but I will post them ASAP. All I know is that it will be in July this year. 'THUNDERBIRDS' is coming back to our screens. Yes it's true. TV3 (New Zealand) is to screen the digitally remastered episodes on our screens in July. This is due to backed up with the merchandising campaign that has swept the UK with new figurines, toys, books and more. I have no more details at the moment but I will confirm as soon as I know more. STINGRAY features on Prime TV! STAND BY FOR ACTION - Yes Troy Tempest, Phones, Marina, Commander Shore and Atlanta are back on our screens in New Zealand. Starting on Sunday 1 April 2001 @ 6:30pm and playing Sunday - Friday evenings the super sub will be doing its best to rid the oceans of the evil Titan and his secret agent X20. Hopefully this is a forerunner to the screening of Thunderbirds, Captain Scarlet and Joe 90. On the subject of Thunderbirds, Blackstar are advertising the release of the movie "Thunderbirds Are Go!" on DVD to follow on from the release of the TV series on DVD. I haven't had the chance to view the DVD's yet but from what I've heard they are an excellent addition to anyone's collection. SCI in the UK are launching a Gameboy gaming version of Thunderbirds due for release in December. Playstation 2 and PC versions of the game are due for release in the 3rd quarter of 2001. SCI have caused a stir amongst some fans of the TV series by featuring a remodelled Thunderbird 1 in their promotional video. Screen captures and video footage can be viewed at their site (beware the footage is about 12Mb). Vivid Imaginations, the people who have bought the UK the latest Thunderbirds toys, are working on the shortfall of toys consumers are experiencing. It is due to a lack of the Soundtech chips produced by Motorola, but they are hopeful of being able to supply some orders prior to Christmas. Thunderbirds the TV series is now being re-screened in the UK, along with a full merchandising campaign. Word is that the toys are selling like hotcakes with many of the new Soundtech toys having sold out already (and there's still 7 weeks to Christmas). The original film stock has been digitally re mastered and now features a stereo soundtrack. The series has also been released on DVD in the UK and is due for release in the US in February 2001. Still no word on a New Zealand release date, I have been in touch with the major TV companies but none has committed to re-screening the series as yet. .
A new Captain Scarlet movie is currently in production. The movie will feature Computer Generated Images (no Supermarionation this time) but it will retain all the vehicles, costumes and story lines of the original series. The Mysterons and Captain Black will be back, darker and more mysterious than ever! Enjoy the site and if you have any suggestions then please drop me a note and I'll see what I can do for you. TM and © 1965 and 1999. THUNDERBIRDS, CAPTAIN SCARLET, JOE 90, FIREBALL XL5, STINGRAY & SUPERCAR are trademarks of Carlton International Media Limited and is used under license. THUNDERBIRDS, CAPTAIN SCARLET, JOE 90, FIREBALL XL5, STINGRAY & SUPERCAR are Gerry Anderson Production licensed by Carlton International Media Limited.